This post was going to be called "Gargoyle blindness", but you'll have to wait for that one, because I left my camera in my college office with all the photos on it. Instead, I'm picking up on Keren David's excellent and thought-provoking post of yesterday. I was not black, or gay or Jewish or disabled or a member of any other group that is/has been under-represented in children's books. But children will always find something to pick on in others (and themselves). I was bullied for - I don't even know what. Being different. But we're all different. We just don't all have a nameable 'different' group. I suppose I could say that I did see children like me in books because there are books about children who feel different. There are a lot of them. Which might give us a clue: all (almost all?) children feel different, excluded, isolated, not like everyone else. Of course, if you also belong to an ethnic minority or under-represented group, you probably feel even more different, as you have the Keren-flavour of difference as well as the universal, existential difference. Perhaps there are two distinct kinds of children's books. (OK, there are lots of kinds - but this is one way of dividing them.) There are books about a single protagonist and how they are different and suffer/triumph as a result. These are books like Peter Rabbit and Eleanor and Park, Twocan Toucan and The Little Princess, Heidi, Elmer and The Bunker Diaries. 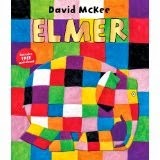 (There's a good exam question in that - how are Elmer and The Bunker Diaries alike?) Then there are the stories that offer a gallery of characters and invite readers to identify with one of them. A gazillion Enid Blyton books, and any number of multi-authored My Little Alien Unicorn Space Fighter series are the most obvious examples. But there are more thoughtful books, too - The Silver Sword, for one. And there are books that pretend to be the second and are actually the first, like Little Women - because is there anyone who preferred another character over Jo? (Doesn't just choosing to read the book align you with her?) Or Harry Potter, which pretends to be the first type but over the course of the series becomes the second type. The different functions and appeals of the two types are too complex to consider here, but the first deals most thoroughly with the feeling of being different and becoming comfortable with it, discovering one's own strengths and weaknesses. The second is more concerned with fitting in - with seeing there are other people like you that fit comfortably into a group, and little differences are not a barrier to acceptance. I think, perhaps, it's the second type that in particular needs to be careful to represent as many different types of child as possible as they are the books that invite children to pick the character like them to follow through the story. Is there a division between children along these lines - preferring one type of book over the other? I'd be interested to hear in the comments which you preferred. I overwhelmingly preferred (and prefer) the first. I had no time for Famous Five, Malory Towers or any of that. The Little Unicorn, The Wolves of Willoughby Chase, Mrs Pepperpot and Dr Dolittle were my favourites. Confession time. 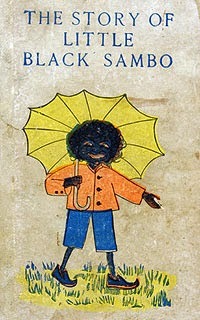 My favourite book, when I was five, was Little Black Sambo. That's an unacceptable book now, of course. But I didn't know it was unacceptable (and indeed it wasn't in the 1960s), and I can remember why I liked it. The boy was so cool. He could outwit tigers! I can remember the first reading, when I was so upset that he lost his colourful clothes - and then it was all OK. He had the life I wanted (including good weather and blue trousers) - he defeated the bullies and, in true fairytale style, ate them so that they were definitely gone. How was Sambo different? Because he wasn't a tiger, and tigers were in charge. Not because he was black. How was he like me? He was bullied by people who weren't like him (people who were tigers, but hey, it counts). you keen to go shoe-shopping. The point was that I could empathise with Sambo because he was a child in a spot of bother. Quite a big spot of bother, actually, with those predatory tigers. It was *just* like being bullied at my primary school. 'If you don't give me your apple/pencil/scarf...' Little Black Sambo was a child like me. Except that he lived somewhere warm and got to eat butter made out of melted tigers. How amazing was that? And those shoes! I wanted shoes like his. In some of my other favourite books, the characters weren't even human. I could empathise with Moomins - no problem there. Or animals. I could read those stupid stories set in boarding schools, even though I knew no one who had ever been to a boarding school, even though I didn't really like them. 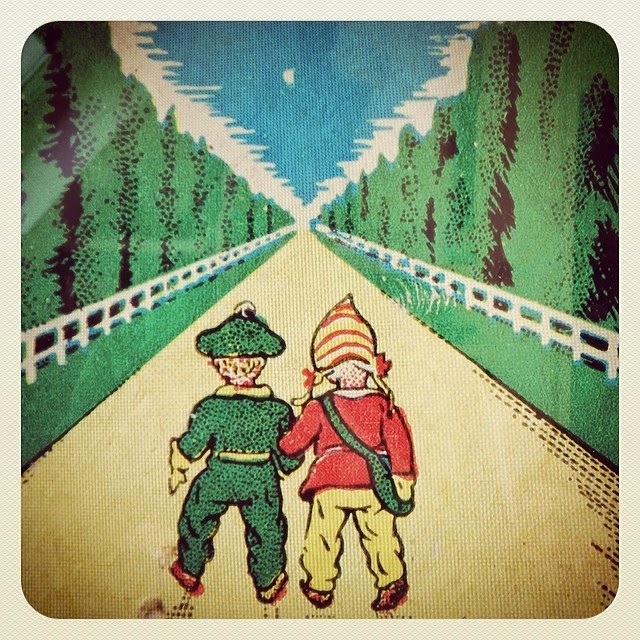 I read books about boys. None of it mattered, because I was reading books for the bits that are the same no matter who you are, the bits that are part of the human condition - and that included the existential angst of realising that no one is like you. But on the other hand people (or moomins) can look very different and be just like you. I read books about people who were not superficially like me and found comfort in the characters being like me at a deeper level. Which is not to say we don't need more diversity in children's books, or that we shouldn't endeavour to show children of all types. But what I think is most iniquitous is when books show children (or adults) of a particular group or type in a consistently bad light (or only one type - white, pretty, athletic - in good positions). When all the Jewish characters are like Fagin, or all the fat girls in boarding school stories are stupid, or all the ginger kids are freaks, that's bad. Because we see past superficial differences unless they come to stand for something. So while in one way there were no children like me in the books I read, in another way there were a lot of children like me because they were humans (well, living beings) and they were individuals. But I couldn't outwit tigers. Fair enough, Anne, I see your point - but as you say, you weren't black, Jewish, etc. So it made it easier for you to enjoy the positive stuff. It might have been different to hear this from someone who didn't see themselves. - or who saw themselves in a negative light. Brilliant post. Properly looking inside a child's head, I think. I was "different", because I was the only girl in a boys' school (and some other things made me feel different, too) but yes, it's a part of growing through childhood that you are aware of your own differences and trying to work them out. This is a thoughtful and enriching post, Anne. I really appreciate your honesty about Little Black Sambo. I think what you have said helps us remember that truly engaged readers [and writers] can get under the skin of a myriad of different people. So it follows that more diversity the better - for all of us. Interesting stuff! I always enjoyed Moominland Midwinter because Moomintroll was in a familiar world but it had changed and been populated by strange people. The idea of the familiar becoming unfamiliar resonated with me. But I can see that it's a far cry from being the only member of a minority group. No problem liking Boys' books, Anne. I enjoyed reading Mallory Towers. The only time I came across Little Black Sambo was at the dentist, which is not a perfect introduction to a book, but I still remember it, so it must have made some sort of impression. It didn't seem strange to me either, and I definitely did not link golliwogs to black people, or think them inherently evil no matter if Enid Blyton painted them that way. I suppose that means that there is a golden opportunity to introduce children to other cultures... if you can get it past the gatekeepers. Richard, I think I'd rather use something else to introduce children to other cultures, if they aren't already mixing with them at school. Who are the "gatekeepers" you had in mind? Just to be clear (probably unnecessarily) I never had any problem finding characters to identify with in literature. They might be from any gender, background, ethnicity, species - that's why we read. But I did a) notice negative stereotypes of Jews b) notice that the sympathetic Jews in books were usually victims and c) rarely saw anyone who shared my ethnic identity in books that I read. Which made me feel invisible. Oh Anne Rooney - I think you've spotted here that the pc Emperor is starkers, and I hugely admire you for it. I didn't want to read about people like me when I was a child, and I didn't feel 'excluded' from the world of princesses etc, although I actively hated Winnie the Pooh because it portrayed a world I didn't feel comfortable with - very middle-class, with a Heals nursery and a spider-rescuing glass somewhere in the picture (we squished them). On the other hand, I've always felt uncomfortable around Shylock and Fagin - such stereotypes DO affect people's attitudes and behaviour, as the Nazi propagandists knew only too well.